View of high-rack aluminum / uPVC Plastic profile storage. The storage system features a “honeycomb” type storage system. Thousands of packs / master bundled of profiles contained in the main honeycomb structure are stored and retrieved automatically. Cycle time for the “picker” is 3 minutes for the retrieving or positioning of a single composite panel which allows for an extremely high turnover in the plant (up to 20 loads per hour). The maximum speed of the “picker”, as chosen by the customer, is up to 130 metres per minute for the lengthwise speed, 20 metres per minute for loading / unloading speed and a lifting / lowering speed of up to 20 metres per minute. 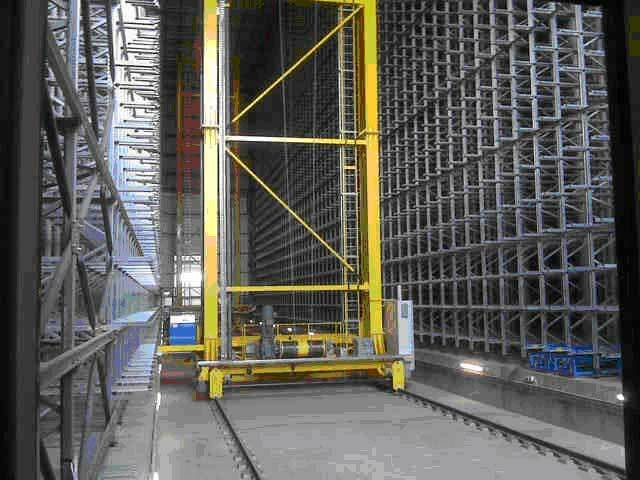 All profile products are loaded and unloaded automatically onto underframes used in the high rack storage system which improves operation and ensures that panels are not at risk of damage. 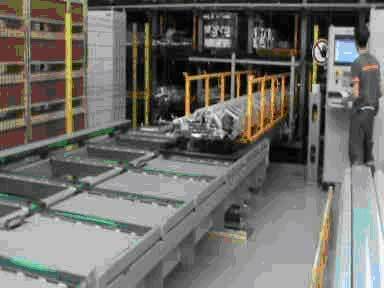 Image of automatic loading / unloading of profile products onto underframes. The following parameters can be recorded and used to identify and route all the profile products. - other informations required by user of the system. The product codes can be inserted automatically using barcode labels attached to each load. We can design a high-rack storage system for also other type of products, no matter whether they are big or small sized products. If you are working in logistics, storage, depot, handling, transportation sectors and need s solution to your needs please let us have your call.